Citation Information: JCI Insight. 2016;1(8):e86914. https://doi.org/10.1172/jci.insight.86914. Infections are an important cause of morbidity and mortality in patients with decompensated cirrhosis and ascites. Hypothesizing that innate immune dysfunction contributes to susceptibility to infection, we assessed ascitic fluid macrophage phenotype and function. 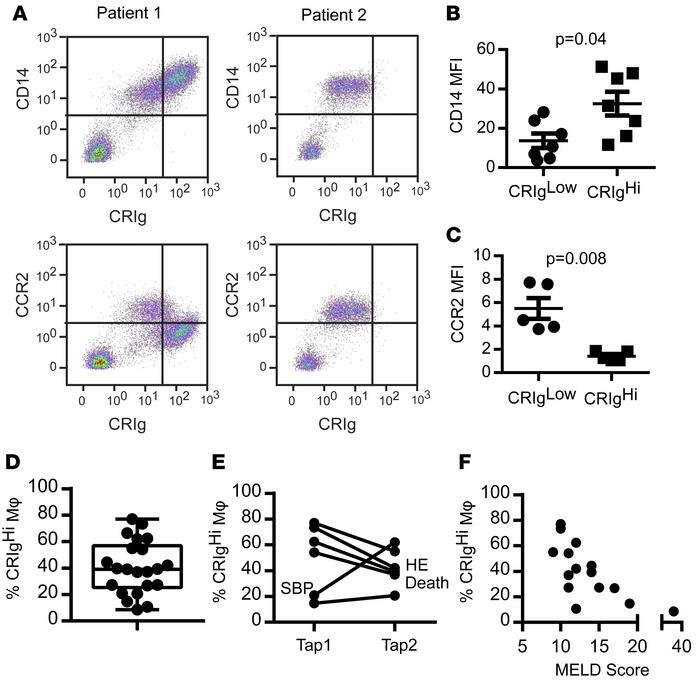 The expression of complement receptor of the immunoglobulin superfamily (CRIg) and CCR2 defined two phenotypically and functionally distinct peritoneal macrophage subpopulations. The proportion of CRIghi macrophages differed between patients and in the same patient over time, and a high proportion of CRIghi macrophages was associated with reduced disease severity (model for end-stage liver disease) score. As compared with CRIglo macrophages, CRIghi macrophages were highly phagocytic and displayed enhanced antimicrobial effector activity. Transcriptional profiling by RNA sequencing and comparison with human macrophage and murine peritoneal macrophage expression signatures highlighted similarities among CRIghi cells, human macrophages, and mouse F4/80hi resident peritoneal macrophages and among CRIglo macrophages, human monocytes, and mouse F4/80lo monocyte-derived peritoneal macrophages. These data suggest that CRIghi and CRIglo macrophages may represent a tissue-resident population and a monocyte-derived population, respectively. In conclusion, ascites fluid macrophage subset distribution and phagocytic capacity is highly variable among patients with chronic liver disease. Regulating the numbers and/or functions of these macrophage populations could provide therapeutic opportunities in cirrhotic patients. CRIg defines a subpopulation of macrophages in ascites fluid. (A) Representative plots showing CD14, CRIg, and CCR2 expression on cells obtained from ascites fluid from 2 cirrhotic patients. CD14–/CRIg– lymphocytes are shown for reference; however, CD14+ macrophages were gated for analysis of fluorescence intensity. (B) CD14 (n = 6) and (C) CCR2 (n = 5) median fluorescence intensity (MFI) on CRIghi and CRIglo macrophages. (Mann-Whitney test). (D) Proportion of CD14+ ascites cells expressing CRIg in ascites fluid (n = 22, box represents 5th to 95th percentile, with whiskers indicating minimum and maximum values and the line at the median). (E) Longitudinal variation in the proportion of CD14+ ascites cells expressing CRIg. Clinically significant events are annotated (n = 6, approximately 3 months between paracenteses [“taps”] for each patient). SBP, spontaneous bacterial peritonitis; HE, hepatic encephalopathy. (F) Correlation between the proportion of CD14+ ascites cells expressing CRIg and MELD score (n = 15, spearman r = 0.74, P = 0.002).